In the world today, every company advertises the safety of their product; the safest car, car seat, insurance, bank, anything. This generation has been raised in a “safe” world, no immense dangers threaten the children born into the American life. We are comfortable. Have we forgotten, then, that God is in charge over all things, including our lives. The safest place for us to be is in the center of God’s will. What I am presenting is that, even though the rest of the world may not seem “safe” to us, if God intended for you to witness to people in Iraq or Afghanistan, you will not be in danger there, because God will protect you as he sees fit. So, for some people, living in a war-torn country or country with many dangerous animals is as safe as living in America driving the “safest” car with the “safest” job. It doesn’t matter where we are that determines our true safety, it is who is with us that determines that. 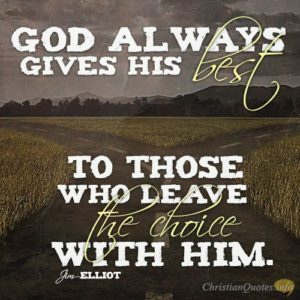 Jim Elliot once said,” God always gives His best to those who leave the choice with Him.” You see, safety is merely a matter of chance. The “safer” somethings is, the lower the chance of something going wrong is. God is not the God of chance. He knew us before we entered the womb. He knew how our whole life would play out before we were created, so it doesn’t matter where we are, His will will always be realized. Just like Jonah, running away from what we see as the danger will only result in us getting in more danger we were not intended to be in. Jonah tried to cross a sea to escape God’s will, only to end up in the belly of an unusually large fish. If he had only gone to Nineveh in the first place, the place that he thought would put him in the most danger, he would have been perfectly safe. But Jonah did not trust God. He didn’t trust God to keep him safe even when just bearing a simple message, even when God promised to keep him safe and judge the Ninevites according to their actions. If we only had faith in the God that created us and brought us safely this far, we could do so much more for Him and live a far less worrisome life. God does not promise us an easy life, but He does promise us a good one under the protection of His mighty hands.